This is the fence surrounding my garden and it’s obviously not new. 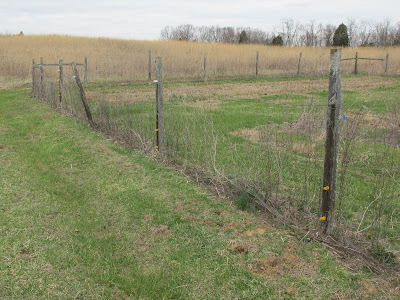 I built the fence 24 years ago and combined the physical barrier with a strand or two of electrified wire to keep the deer from feasting on my garden bounty. The fence has exceeded its life expectancy and needs to be replaced. Normally, I would tear out the old and replace it with new, but I’m not comfortable following that course of action. The wooden cedar posts that I used in the fence construction, have become the foundation for a multitude of lichen species. I’m not anxious to destroy what has taken over two decades to become established. 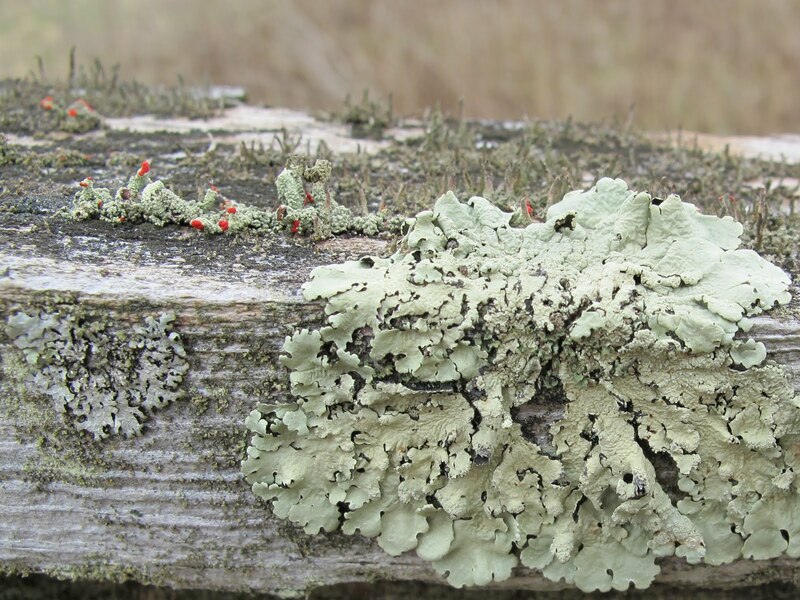 I’m not good at lichen identification, so I can’t say for sure how many species are actually here. 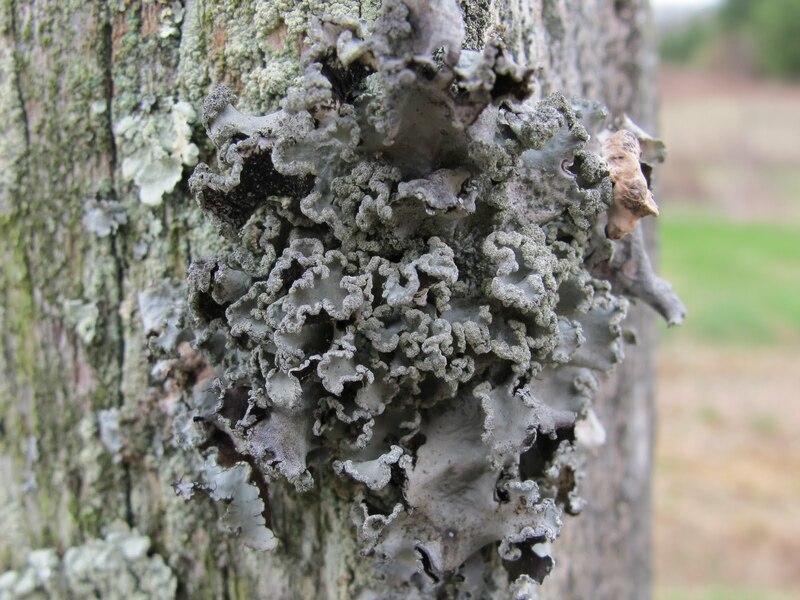 I know that there are many rare lichens and that some lichens are sensitive indicators of environmental conditions. I don’t like to destroy things when I don’t know what they are. 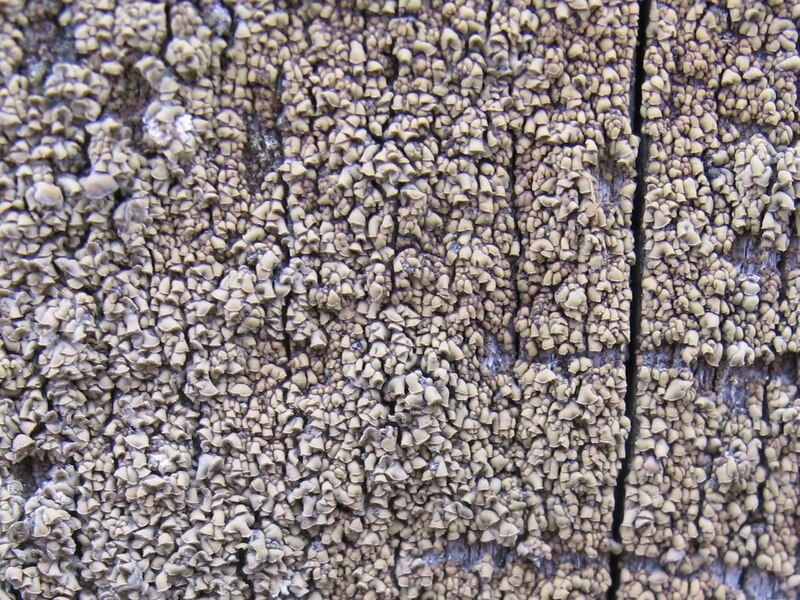 I also feel some responsibility for the lichens having colonized here. I placed the fence posts and in so doing, I invited life to take up residence. If there is a chance that I inadvertently created a place for rarities to thrive, I don’t want to unknowingly destroy that habitat. I would hate to be like the person that puts up a lawn ornament that also provides an unintended space for cavity nesting birds and then keeps cleaning out the resulting nests. I think it’s my responsibility to see that I’m not creating an attractant that will be detrimental to the local flora and fauna. 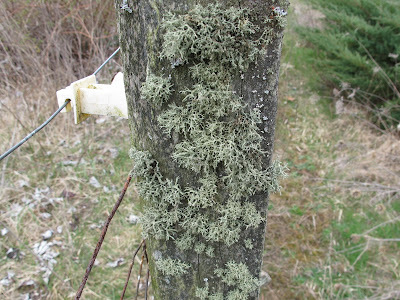 So, until I know more about lichens, I don’t want to destroy what’s growing on the fence posts. 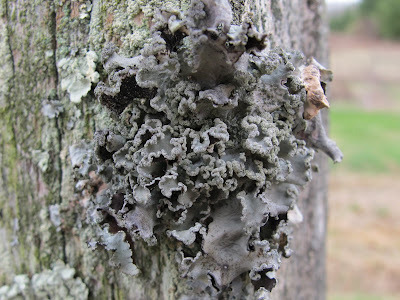 Besides, I really like lichens and I just enjoy having them growing in such an easy to view location. 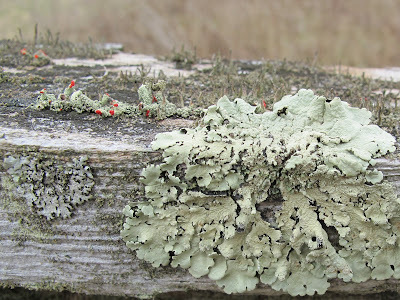 I still plan on replacing the fence, but I’ll do it in such a way that protects the posts and their lichens. It seems all too often that you hear of a rare plant that is in bloom and it is just a little too late to schedule a visit to get out and look at it. The plants that I’m featuring today are rarities that are seldom seen by the casual wildflower hunter. That’s because these plants will begin opening blooms this week and will be long past flowering when the typical spring bloomers are at the peak. Small plant size is also a factor in these flowers being overlooked. 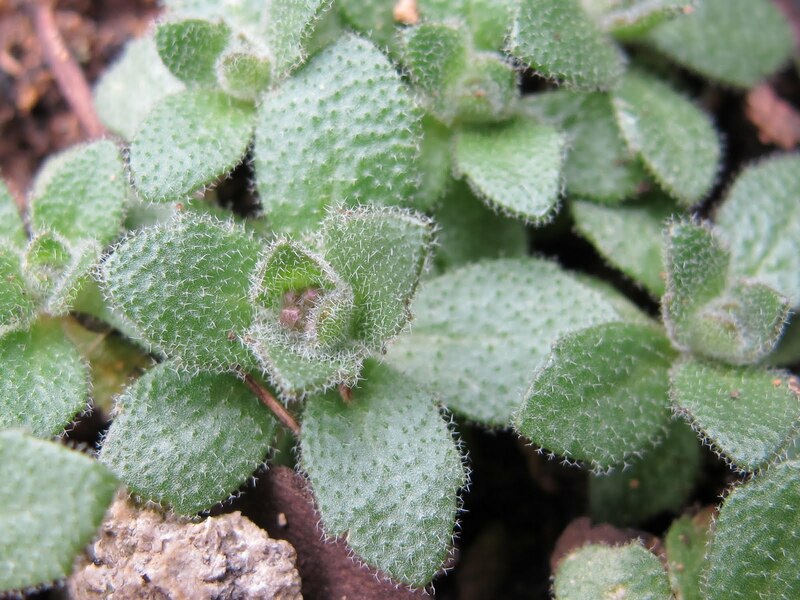 This is Draba cuneifolia with flower buds beginning to emerge. A dime could smother every plant in this photo. This Draba reptans is is only days away from blooming. This individual, an extremely robust multi-flowered specimen, tops out at 1 inch in height. Most of the Draba reptans plants bear only a single flower and are the tiniest of the tinies. The eraser of a number 2 pencil would be more than adequate to cover both of these plants. A typical specimen of Leavenworthia uniflora is not much larger than the Draba cuneifolia. This plant has produced a single flower stalk. The Drabas and the Leavenworthia are both winter annuals that are normally found on bare, disturbed ground where other plants have a problem growing. The plants put all of their energy into flowering and producing seed to insure future generations. Leavenworthia uniflora has the potential to produce a large plant if soil conditions are good. This plant shows several flower buds beginning to emerge. 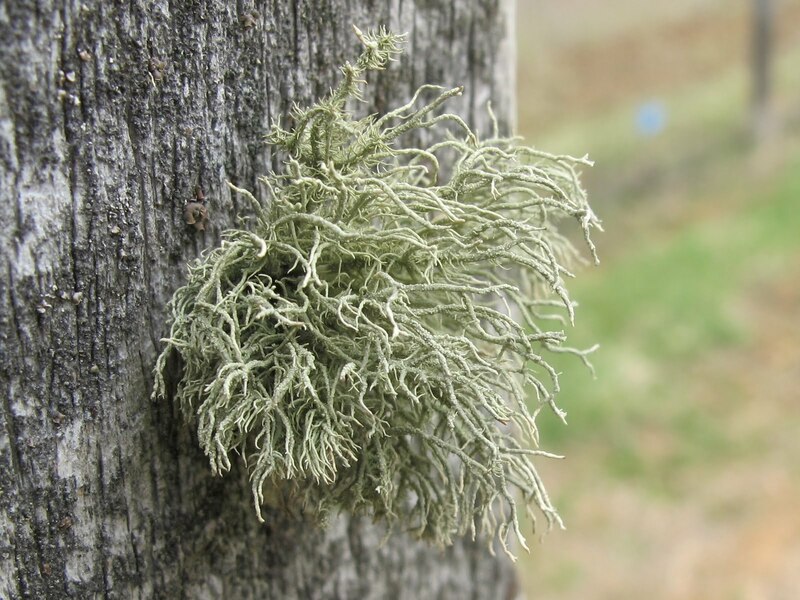 Just because it is cold and windy and wet during this time of year, don’t miss your chance to get out and have a look at these early season oddities. Doing something different is usually a sure way of seeing something different. For a look at these plants in bloom, check out the posts on the Ohio Flora Blog. After withstanding several rains since being burned three weeks ago, the prairie garden is looking more barren and less charred. The rains have caused some erosion, but it’s nothing that will inhibit the desired plants from thriving. I chose this location for the prairie garden because the soil was so poor and rocky that lawn grass wouldn’t survive. Those were the exact conditions I needed for the barren and prairie plants I hoped to grow. Conditions were great for the first couple of years, but the mass of prairie plants improved the soil so much by adding organic matter and providing erosion protection that weeds were able to become established. Non-native grasses are now continually trying to take over. 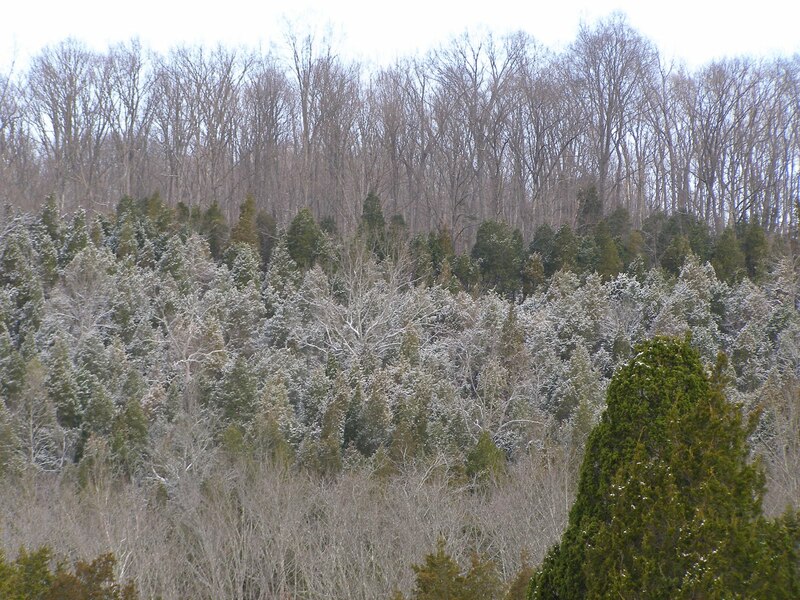 Bluegrass is usually only noticeable in the early spring. Within a month, the other plants will overtop and hide the Bluegrass from sight. The grass will still be in there competing with the other plants and if given the chance, will thicken into a tight sod. Even as scattered individual plants, the Bluegrass can provide detrimental competition to the native species. Tall Fescue also takes advantage of the improved soil conditions. Fescue is more aggressive than the Bluegrass and is particularly hard on the native forbs. There are very few wildflowers that can maintain themselves in a sod of fescue. Fortunately, these non-native grasses begin growth very early in the spring. After an early burn, they are the first plants to show new growth. At this stage, heavy infestations of grass can be safely sprayed with glyphosate herbicide with minimal risk to non-target species. Plants that have not yet begun to grow will not be harmed by the herbicide. Before spraying, you do have to be sure there’s nothing growing that you don’t want killed. Even though most native plants have not begun to emerge, there are a few, like this Western Sunflower, that are up and going. The seedlings are a non-native called Black Medic. They respond much as the non-native grasses and are really thick following an early burn. The trick is to vary your management techniques so you don’t favor the same weed species year after year. People keep asking for an explanation for the absence of my Blue Jay Barrens blog over the winter and usually phrase their request in the form of the question “Where were you?” I was going to dig through my winter photos and use them as visuals to accompany my story, but with the Sunday morning snow yesterday, I decided I would just take some fresh photos. I hope the photos are of interest, because the story isn’t much. While uploading photos in December, I received an error message saying that the destination file was not found. A quick check revealed that I, along with everyone else, had lost contact with the blog. The problem persisted the next day, so I submitted a request for assistance in becoming reconnected. Another day passed and still I had no connection. I have little patience with equipment that doesn’t work properly, so I shut the computer off and looked for something else to do. I have no shortage of activities that I would like to pursue. Suddenly, the time I had devoted to the blog was taken up by other things. I figured I would give the experts time to fix the problem and then I would continue blogging. It apparently only took a few days to get the problem corrected, but it took three months before I turned the computer back on. During the blog’s down time, I was doing pretty much what I always do. My days were filled with going to work, spending time with the family, taking pictures and working on the property. I was told that someone thought I had died and I’m sorry to be a cause for concern, but I don’t believe my last dieing act will be the dismantling of this blog. The blog is back in my schedule and should continue until the next unforeseen circumstance. I’m often asked how I manage to post every day. Well, it was never my intent to post daily, but there are people who visit every day and it seems to me like there ought to be something new for them to see on each visit. I carry my camera with me whenever I’m outside, so I take a lot of pictures. If I’m just out walking, I average about 100 shots per hour. I have plenty of photos to post and I just try to vary the subjects enough to give a well rounded selection of what I’m looking at. With the photos come the words. “The Words” is what I call the narrative in my blog. I’ll read through my text to correct typing errors, but I really don’t do any editing. I think some people have suspected that. What I type is pretty much what I would have said if we’d been standing out in the field together, so it’s not really a time consuming process. Now you know what happened and have had a little look behind the scenes of the production of the Blue Jay Barrens blog. I had better go look around for something interesting to use for tomorrow’s posting. I never tire of watching the water flow down the creek. I really enjoyed seeing the water cascading over this rock shelf. This area of exposed bedrock is fairly stable and doesn’t change much. It’s the volume of water that is continually changing and creating new scenes. Enlarged by thousands of times, this could be a classic big river waterfall. Slow water accelerates into rough rapids before plunging over the edge into a churning pool. Occasionally, I just like to enjoy the beauty of a scene and not dwell on the mechanical, chemical, biological or social implications of what I’m viewing. I must have set for nearly a minute watching and listening to the water before something else caught my eye and my mind shifted back into its normal track. Fortunately, for every photo I take, my mood is captured along with the image and can be revisited as often as I like. The nearly 80 degree weather we had a couple of days ago brought toads to the pond to call for mates. When the storm came through on Wednesday night, the temperature fell 30 degrees in about 10 minutes. I hope the toads had a chance to take cover before they got too cold. The water was crystal clear and just the right depth to make the toads comfortable. Toads have been in decline at Blue Jay Barrens. I’m hoping that the construction of additional breeding pools will help restore their numbers. This guy looks like he’s enjoying a bubble bath. The bubbles are actually produced by oxygen being released by mosses that have been submerged near the edge of the pond. The moss grows extremely well in cool water and produces oxygen like crazy. Just to be clear, I’m talking about true mosses and am not using the term incorrectly to describe the algae mats that commonly grow in ponds. Hopefully, toad tadpoles will join the mix of amphibian larvae in the pond this year. Salamanders have already hatched and there are several frog species busily laying eggs. I’ll just have to wait to see if the return of cold weather has messed up the toad’s breeding season. When people think of forces that change the landscape, they usually think of large areas and unstoppable powers such as glaciers and volcanoes. 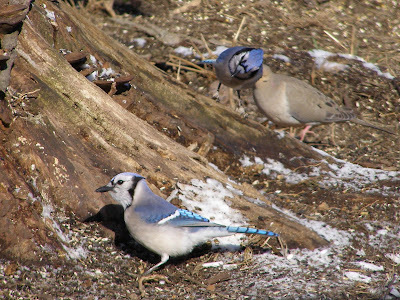 I have to admit that Blue Jay Barrens was subject to that type of force millions of years ago in the form of a meteor strike, but when I think of landscape changing forces, I usually narrow my focus to those things that are confined within my property boundaries. I’m interested in how seemingly small factors determine the developmental course of an area. Here we have a lumpy patch of moss. 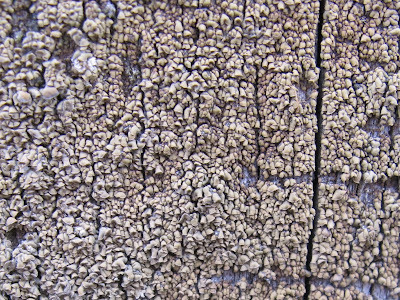 You might imagine that this is the result of mosses growing on lumpy ground. In this particular case, that’s not what happened. This is a rather level area that holds a lot of water during the winter and spring. Several factors have combined to produce this particular lumpy effect. It all began when a cedar tree fell over onto a patch of grasses and blocked the sunlight. The grasses died and moss rapidly grew to carpet the area. The root and dead leaf masses of some of the grass clumps gave the mosses a less saturated substrate upon which to grow. The moss growing on the clumps prospered. Each growing season has allowed the mosses to add to the foundation upon which they were established. The result reminds me of a cluster of South Seas Islands. Standing water seems to inhibit the moss growth, but growing conditions on the steep sided islands are ideal and the mosses flourish. This is all because a tree fell. I always target sites of change as places that might hold something that I have not yet seen. Usually I’m rewarded and I embrace these areas as one more source of diversity for Blue Jay Barrens. I was out at the pond checking on some Wood Frog eggs I had seen over the weekend. I was looking at the right spot, but what I found didn’t look like frog eggs. 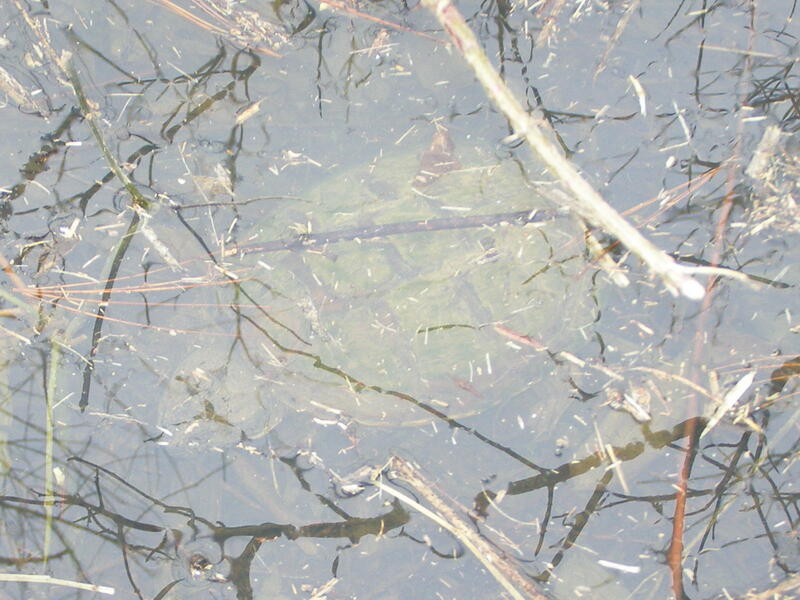 Out of the water, it’s easy to identify a Snapping Turtle. 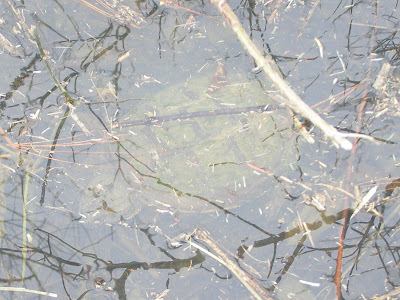 The back of the shell is always camouflaged by algae or some other unsightly mess that allows the turtle to sit inconspicuously on the bottom of a pond or river. The eyes catch even the slightest movement. The tiny turtle brain has a limited number of programmed responses. If something moves, you bite it. If it happens to be food, you eat it. If it is danger, you scare it away. It’s a one bite fits all occasions situation. I’ve always thought the Snapping Turtle shell was poorly designed. The upper shell looks much too large to house the snapper head, while the legs can’t even be fully withdrawn. The design has proven itself over millions of years, so I guess it’s this way for a purpose. The lower shell leaves much unprotected, but the turtle isn’t normally found in this position. Even if something were to attack the lower side, that hide is about as tough as any animal produces. I’m wondering if this is responsible for the sudden absence of Wood Frog eggs. 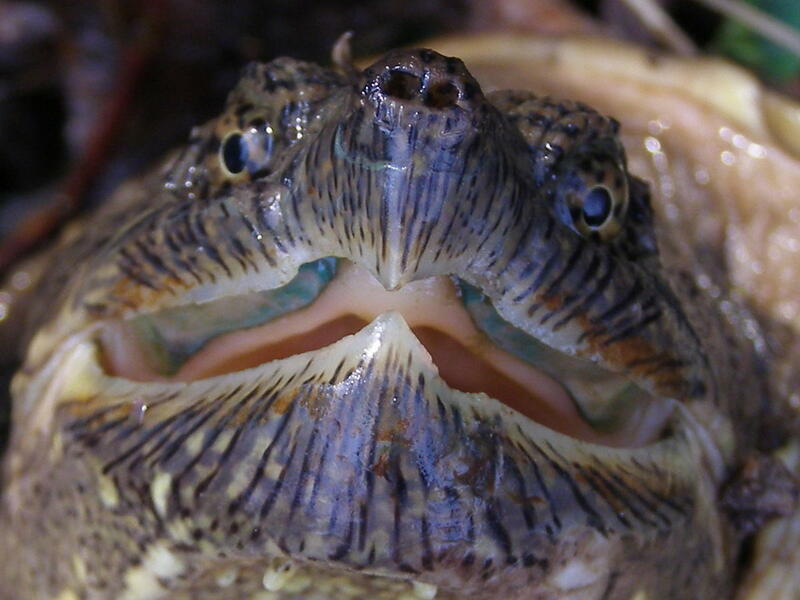 Could that be a frog egg stain in the turtle’s mouth? I’ve seen Raccoons pull frog eggs onto the bank and consume them, but they usually leave a jelly mess behind. I don’t think those eggs ever left the water. Jaws and claws are the Snapping Turtle’s dining tools. Anything too large to swallow is ripped apart by the sharp claws and strong front legs. 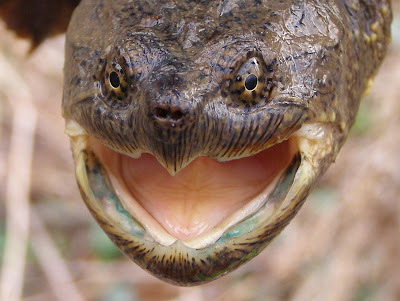 This is certainly a jolly face. I was trying to keep the camera just outside the turtle’s strike range. Even if he had struck, I’m pretty sure he would have gone for the camera lens and not the fingers to either side. Mowing this field took me most of the winter. With all of the snow, ice and rain we had, there were very few occasions of good weather suitable for mowing. This field was mowed last year and all of the woody sprouts were marked. I was able to successfully spray the early developing Multiflora Roses, but a late freeze killed the top growth on later developing woody plants and there was nothing left to spray. This is what the field looked like in early December. I still had this much to do two months later. It seemed that just running JR out of the barn would trigger some type of storm that put a halt to my work. When I look back over my management records, the years showing the most accomplishments are the years with the nicest weather. The job is finally done. The final rounds were made with me enjoying mild temperatures and bright sunshine. My previous spraying of the roses was successful. I only found one rose bush in the field needing sprayed this year. There were a couple of small patches of Multiflora Rose growing outside the field boundary. I took the opportunity to eliminate those little patches while I was working. I made sure to get fully out to the edge of the field. I’m attempting to create some of the partially shaded conditions found around the older prairie openings. There seems to be a suite of rare plants that prefer that type of condition and I’m hoping to expand the range of those plants. This site is destined to become a link to a field about 50 feet away. I’m hoping that links such as this will encourage movement of plants and animals between the isolated prairie patches. One corner of the field has been given over to Redbuds. Redbud is the host plant of the Henry’s Elfin Butterfly, an uncommon species found at Blue Jay Barrens. About 20 years ago, a three day period of lows near minus 30 degrees killed the top growth of most of the Redbuds. The Henry Elfin population became almost non-existent. Since that time, I’ve encouraged several patches of Redbud to grow around the property. Henry’s Elfin numbers are now better than ever. It won’t be long before the 2011 generation emerges and takes to the air.